House Painter Wearing Facial Protection Spray Painting A Deck of A Home. The traditional wooden deck is a favorite of many people; they love the evenly placed planks dotted with rows of nails or screws. While some love the feel of solid-wood deck boards under their feet, some may even love the look of a weathered wooden deck. But these real wooden decks require a little bit of care from time to time. One of the most important maintenance choices you must make for your deck is whether you should go in for deck painting or deck staining. Except for some hard tropical hardwoods, all decks need some sort of finish to last outside. If you skip the finishing coat, it will usually lead to cracking, splitting, warping and even rotting of the wood. 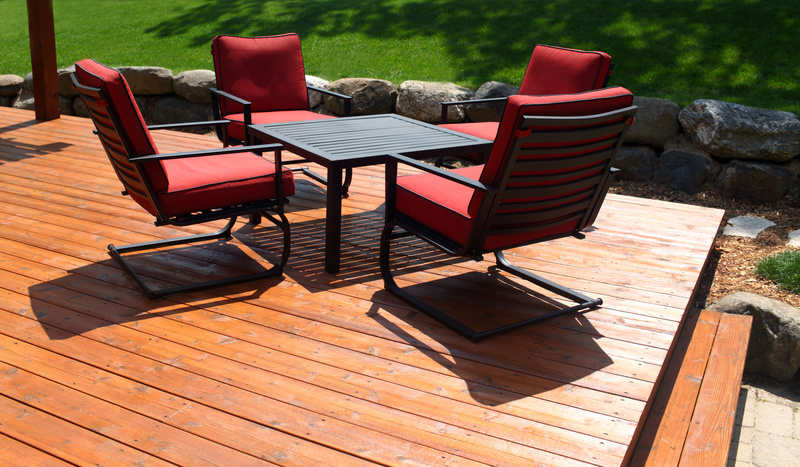 Painting your deck is a great choice and it has quite a few benefits over deck staining. But it is not for you if you love a natural looking wood deck. Painting gives the longest lasting protection against the elements. The high solid contents in paints help form a thick, opaque film on the surface that hide imperfections, resists moisture, and blocks UV rays. Painting gives you a wide range of options, because it allows you to use any color you want. Moreover, as the paint is solid, you can completely cover an old color or the wood itself. As the paint is thicker, it helps fill the gaps and cracks in the wood. Some paints are made to be used for repairing wood that has been damaged by the elements. Painted decks are easier to clean. If the paint used is of good quality and has been allowed to cure properly before put into use, it creates a hard shell that prevents dirt from staining. However, this depends on the color; white color painted decks are not easy to clean. 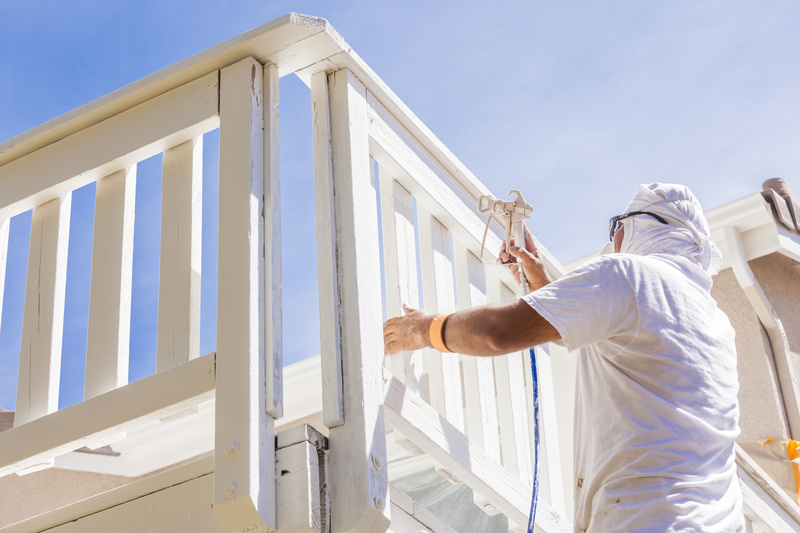 Deck painting is a more protective option to the wood, because it resists rot, mold and sun damage. Painting is a messy job, as you have to prepare, preserve and prime the wood first. Paint is forever. Once you decide to paint your wood deck, you do not have any option to change it in future. You can change the color, but you cannot go back to deck staining. Painted decks can be slippery when wet. Depending on the sheen of the paint used (gloss, semi-gloss, etc. ); painted decks can be as slick as ice when wet. Painting hides the natural beauty of wood. The color, grain pattern and texture of the wood are hidden by painting. A wood deck is exposed to sun, rain and snow, and the constant shrinkage and expansion of the wood causes paint to peel over time. Deck staining if for people who decide that painting is not for them. They will then probably end up with the transparent or semi-transparent stains. There are several types of stains; but there are still pros and cons while you choose to stain your deck. Staining helps retain the natural beauty of wood and it lets the wood grain, texture and color show through. Generally, stain is less slippery. Although there are some stains that can be slippery, most of the stains are more of a flat surface that protects the wood without creating a slippery surface. It is easier to apply stain. Even if you miss a spot here and there, it will not be obvious. Stains are available in a variety of colors. As the wood itself will have a big effect on the finished color of the stain, it is better to test an area of the deck with the stain before buying it. Stains have a shorter life span when compared with paints. The life span of stains depends on the quality, number of coats applied and the weather condition. Stains do not fill cracks. Generally, they are much thinner; so, they cannot be used as a repair material to fill cracks, splinters and voids. Deck painting and deck staining both can give you a deck that lasts longer than an untreated deck. Paints and stains make the wood less water absorbent and keep it dry on the inside. They have compounds that protect the wood from harmful UV rays, which means less of sun damage. Alan and Cathy had a dining room ceiling that was a plain coffered ceiling, but with lots of potential. So, after talking with them about what they wanted to do, we added small crown molding in all of the coffers. Then we added trim around the entire room just below the coffer beams. we painted everything from this trim up semi gloss white. we then painted the ceiling inside each coffered area a lighter shade to match the new wall color they were having us paint. It ended up looking fantastic, and they were very happy. We are experienced painting professionals in residential and commercial painting, providing interior, exterior painting, tray ceiling painting, Beams, Coffered Ceilings, Suspended Ceilings, Custom Ceiling, transforming Coffered Ceiling Dining Design at best prices. 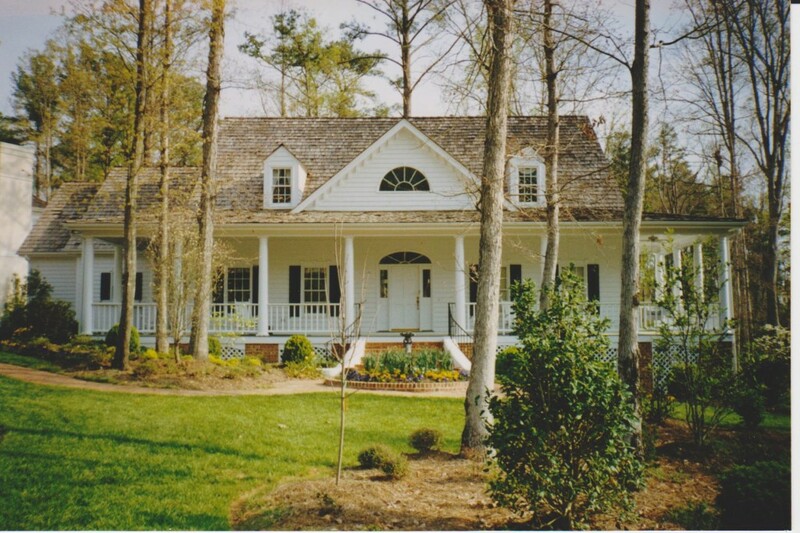 Call our office at (919)-368-8647 for a FREE In-Home Estimate Online. This entry was posted on Monday, April 27th, 2015 at 11:00 am and is filed under Painters. You can follow any responses to this entry through the RSS 2.0 feed. You can leave a response, or trackback from your own site. The purpose of this blog is to instruct people to save time and energy doing house painting….